Colloidal Silver -- No Home Should be Without It ! What the experts say. 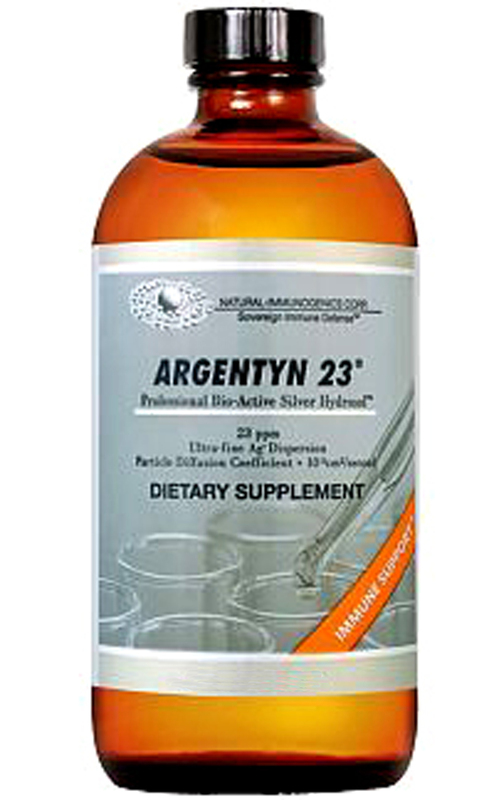 . .
Argentyn 23™ is an exclusive proprietary formula designed to provide safe and precise levels of functional silver. Argentyn 23™ features a unique particle size (average 0.0008 microns) and ultra-fine dispersion that may enhance bioavailability of silver ions. The silver content is 99.99% pure. 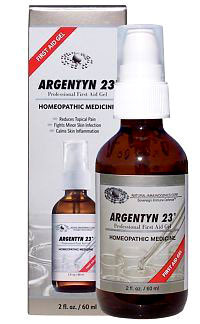 Argentyn 23™ is the purest, safest*, and most effective colloidal silver hydrosols ever seen in the history of colloidal technology. 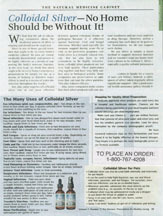 Sovereign Silver® is the #1-selling colloidal silver product on the market. Our professional brand, Argentyn 23®, is trusted by thousands of doctors. Over the past two decades, the term “colloidal silver” has been dramatically polluted by manufacturers that produce (knowingly or unknowingly) silver products contaminated by the presence of salts, proteins, compounds, stabilizers, and oxidation – all of which serve to degrade and diminish the bio-activity of the silver, and render it potentially toxic. To maintain the high quality and purity of its silver hydrosols, Argentyn 23 is bottled in amber glass as opposed to some manufacturers still using plastic. Silver has always been one of the most universal antibiotic substances. When administered in the colloidal form, it is non-toxic. Just as we would die within a few minutes if our lungs were suddenly incapacitated, a microbe cannot live without proper respiration. It suffocates and dies. More importantly, colloidal silver does not damage human enzymes or alter the body’s chemistry. Colloidal silver is a powerful, natural antibiotic and disinfectant. When it arrives near a one-celled microbe, it inhibits the cell’s metabolic enzymes necessary for energy utilization. Germs cannot build a resistance to the action of silver. There are no known organisms that can completely withstand the impact of silver. Studies performed at the UCLA School of Medicine Center for Health Sciences confirmed that colloidal silver kills harmful bacterial, viral, and fungal organisms just minutes after contact. It does not affect the “good bacteria” of the digestive system, or the Doederlein bacillus, essential in preventing yeast infection in women. Therefore, pro-biotic programs can be continued while taking colloidal silver, without the fear of contradiction. Man’s use of silver as a disinfectant dates back to our earliest recorded history. The Greeks and others used silver vessels for water and other liquids to keep them fresh. The Egyptians used silver as a thin beaten paper-like product and wrapped it around wounds to avoid infection. The Druids lined their drinking vessels with the metal for disinfecting and sanitizing water. It was observed that those ancient families who ate from silver utensils rarely were sick and had few infections. This knowledge passed on to kings, emperors, sultans and their families and members of their royal courts. They ate from silver plates, drank from silver cups, used silver utensils and stored their food in silver containers. Settlers in the Australian outback suspended silverware in the water tanks to retard spoilage. Generations ago, pioneers trekking across the Wild West in the US faced many hardships. Keeping safe drinking water was one of them. Bacteria, algae, etc., found a fertile breeding ground in wooden casks, which were carried by the wagons. They placed silver coins in the casks to retard the growth of the spoilage organisms. They also placed silver coins in their milk to keep it fresh. Wrapping wounds in silver foil was a common treatment around the turn of the century to prevent infection. Eventually, man learned to make silver nitrate and use it in wounds as an antibiotic. But silver nitrate is a silver salt and is caustic, and therefore burns tissue, much like iodine. These early, unstable and crudely made silver solutions were sometimes injected directly into the body, taken orally or applied topically. Remarkably, there were no significant side effects. Jim Powell reported in a Science Digest article in March 1978, titled “Our Mightiest Germ Fighter”: “Thanks to eye-opening research, silver is emerging as a wonder of modern medicine. An antibiotic kills perhaps half-dozen different disease organisms, but silver kills hundreds. Additionally, silver-resistant strains fail to develop”. While silver has been used for centuries to purify water, modern ionization technology was developed by the National Aeronautic and Space Administration (NASA) in the early days of the space program as a lightweight method of purifying recycled water on spacecrafts. In the United States and Canada, more than 100 hospitals have installed silver-based water purifying systems to eradicate Legionnaire’s disease, a deadly bacteria that infects hot water pipes and storage tanks in large buildings. Antibiotic resistance is quickly becoming a public health nightmare. Traditional antibiotics continue to lose their ability to kill certain strains of bacteria. To date, nearly every disease causing organism known has become resistant to at least one antibiotic, and several are immune to more than one. Scientists have known since the dawn of antibiotic age that the more an antibiotic is used, the quicker it tends to become useless due to bacterial resistance. Silver has been proven to be useful against hundreds of infectious conditions. The list of minor and serious conditions that can be resolved using colloidal silver is practically endless. Additionally, there has NEVER been an interaction with any medication. Colloidal silver has been found to be both a preventative and a remedy for infections, and fermentation due to any bacteria, fungus or virus, especially staphylococcus and streptococcus, which are found present in almost every disease condition. Through simple high school biology studies we learn that all living things exist in the colloidal form. The body can more readily use medications already in the colloidal form, as opposed to the crystalline form. Colloidal silver is one of the most usable form of the most effective disease fighter there is. The body utilizes colloidal silver to fight disease-causing organisms, and to aid healing. Consumption of colloidal silver on a daily basis is like having a second immune system. It would significantly reduce the incidence of infection. The ability to use colloidal silver safely on a daily basis could be a powerful preventative health measure to enhance the lives of millions of people susceptible to chronic infections. The basic uses of colloidal silver can be as a preventative and curative source. The EPA (Environmental Protection Agency) reported that the US Government participated in The Clean Water in Homes in Border Area Municipalities Program, at the request of the Mexican government, to provide clean water to all of the country’s communities. Few people are aware of the full range of therapeutic possibilities that colloidal silver offers. They might rinse their gums with it before swallowing, but not think about using it for anything else. By spraying it externally, you can clear up everything from acne to athlete’s foot, diaper rash and poison ivy. The results are uniformly amazing. Spray it directly on festering sores, psoriasis and skin rashes and watch what happens. Rinse your mouth with it, gargle with it, soak dentures in it, and bad breath is a thing of the past. Add to bathwater, douches, colon irrigation, and nasal spray. Drip into eyes and ears for minor infections or inflammations. Put colloidal silver in a pump bottle and spray it around kitchen and bathroom. Mist countertops, cutting boards, sponges and towels to eliminate bacteria and the infections and malodors they bring. Spray fruits and vegetables before storing, and add to milk to retard spoilage. Using colloidal silver in home canning or freezing can vastly improve the shelf life and freshness of the food. Add to dishwater and mopping solutions. Add a capful to a gallon of water and use it as plant spray to eliminate unwanted fungus and bacteria causing root rot, etc. Add it to water base paints and never worry about mold or mildew again. In humid areas, spray on carpets drapes and stored clothing to avoid mildew and musty odors. This is a pure and safe element and you cannot overdose. The U.S. Government’s Center for Disease Control confirmed in 1995 that there has never been any allergic, toxic or carcinogenic reactions to colloidal silver. And the Environment Protection Agency has reported that silver is neither an eye nor skin irritant. Richard Davies and Samuel Etris of The Silver Institute, in a 1996 monograph entitled “The Development and Functions of Silver in Water Purification and Disease Control”, discussed three mechanisms of deactivation that silver utilizes to incapacitate disease causing organisms. They are: Catalytic Oxidation, Reaction with Bacterial Cell Membranes, and Binding with DNA. Silver, in its atomic state, has the capacity to absorb oxygen and act as a catalyst to bring about oxidation. Atomic (nascent) oxygen absorbed onto the surface of silver ions in solution will readily react with the sulfhydryl (-S-H) groups surrounding the surface of bacteria or viruses to remove the hydrogen atoms (as water), causing the sulfur atoms to form an R-S-S-R bond; blocking respiration and causing the bacteria to expire. Employing a simple catalytic reduction/oxidation reaction, colloidal silver will react with any negative charge presented by the organism’s transport or membrane proteins and deactivate them. Studies by C.L. Fox and S.M. Modak with pseudomonas aeruginosa, a tenacious bacteria that is difficult to treat, demonstrated that as much as 12% of silver is taken up by the organism’s DNA. While it remains unclear exactly how the silver binds to the DNA without destroying the hydrogen bonds holding the lattice together, it nevertheless prevents the DNA from unwinding, an essential step for cellular replication to occur.